"Il successo non conta niente se non hai nessuno con cui condividerlo"
Benvenuti al blog di Bee Gees Italy, un diario che,tra le altre cose, raccoglie notizie e testi dal web e da tutti i principali media. Segnala una notizia da inserire. 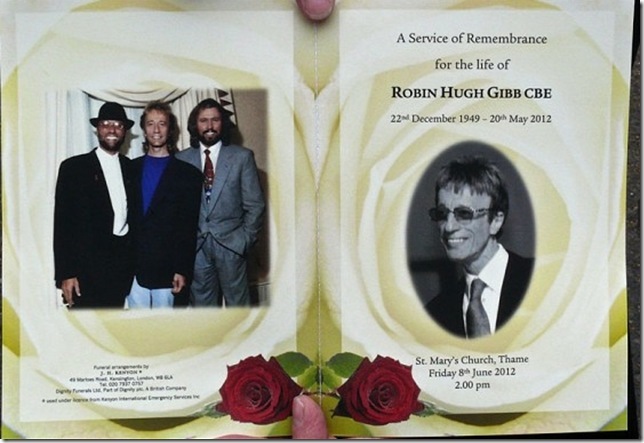 Si sono svolti venerdì 8 giugno a Thame, nell'Oxfordshire, i funerali di Robin Gibb, morto lo scorso 20 maggio a 63 anni. Il feretro, secondo le ultime volontà dello stesso Robin, ha attraversato il paese a bordo di una carrozza di vetro trainata da quattro cavalli neri, tra centinaia di fan e amici. Alla cerimonia funebre, svolta in forma privata, hanno preso parte, oltre ai familiari, una stretta cerchia di amici di Robin e della sua famiglia. Barry Gibb, nel suo elogio funebre, ha dichiarato: "La vita è troppo breve. Nel caso di Robin, assolutamente troppo breve. Ha parlato di suo fratello, definito "acuto, spirito intuitivo" prima di accennare a recenti tensioni tra i due. "Dio sa quanto abbiamo litigato", ha detto. "Fino alla fine siamo stati in contrasto, ma ora questo non significa nulla ". Barry ha esortato i presenti, nella chiesa di St Mary a Thame, Oxfordshire: "Se c'è conflitto nella vostra vita, sbarazzatevene." Parlando di Robin e Maurice, ha detto: "quando sei gemello, sei gemello per la vita", e sono finalmente insieme. Penso che il più grande dolore per Robin negli ultimi 10 anni, sia stato perdere il suo fratello gemello". Centinaia di persone avevano assistito all'ingresso in chiesa della bara bianca ornata di Robin. In sottofondo "How Deep Is Your Love" dei Bee Gees. All'uscita della chiesa un lungo applauso spontaneo ha accolto l'uscita del feretro, ed il corteo funebre, guidato da Barry e dal vicario reverendo Alan Garratt. Dopo di loro i parenti più stretti, tra cui la vedova di Robin, Dwina. Little Snow, la giovane figlia di Robin, nata dalla breve relazione di quest'ultimo con una ex governante, non ha partecipato al funerale, ma è stata menzionata da Barry alla fine del suo elogio nell'elenco dei familiari più strettti. Barry ha reso omaggio a suo fratello "mente magnifica e bel cuore". Minuti dopo che il corteo funebre aveva iniziato la sua strada attraverso le strade di Thames, città adottiva di suo fratello, Barry aveva detto: "la vita è troppo breve, in caso di Robin, assolutamente troppo breve. Avremmo dovuto altri 20 anni, 30 anni della sua mente e del suo magnifico bel cuore". Facendo riferimento a Maurice, ha aggiunto: "Erano entrambi belli. E ora sono insieme. Sono in realtà insieme ". L'anziana madre Barbara, troppo sconvolta per rimanere in chiesa, ha abbandonato la cerimonia all'inizio dell'elogio funebre di Barry. Suo figlio, unico superstite ha detto: "questa è un'esperienza molto strana per me, dopo aver già perso due fratelli, ed ora Rob. Così tante persone hanno amato questo ragazzo, qui c'è tanta gente illustre che lo amava. E questo è un grande piacere da testimoniare. Noi tre abbiamo hanno avuto tantissime folle, ma io non ho mai visto tanto amore in una folla come quello sto guardando oggi: per Rob, per la musica. Ed è un'esperienza molto intensa per me. Penso che sia un esperienza nessuno di noi dimenticherà. La terremo nei nostri cuori e nelle nostre menti per sempre". Durante il funerale la vedova Dwina ha letto una poesia, intitolata "My Songbird". Tra le parole della poesia: "Il mio uccello è volato e la mia anima sospira - ma lui non andrà mai via". E 'stata abbracciata da Barry dopo la fine della sua lettura. La poesia è stata seguita dalla canzone "Don't Cry Alone", una delle ultime composizioni di Robin, tratta dal "Titanic Requiem", che è stato pubblicato poche settimane prima della sua morte. Gli ospiti hanno lasciato la chiesa al suono deella canzone dei Bee Gees "I Started A Joke", che comprende le parole "Sono finalmente morto, ciò inizia fare vivere tutto il mondo". Tra i presenti al funerale alcuni tra gli amici più stretti di Robin: il critico musicale Sir Tim Rice, lo showman Uri Geller, il cantante Peter Andre, il DJ Mike Read ed anche Robert Stigwood, produttore di tantissimi dischi di successo dei Bee Gees e del film "Saturday night fever". Barry Gibb said his brother Robin had been reunited with his twin Maurice as he paid an emotional tribute at the Bee Gee's funeral yesterday. The sole surviving member of the trio spoke of his regret at arguing with Robin right up to the star's death. In a trembling voice he told the congregation: "Life is too short. In Robin's case, absolutely too short. He spoke of his brother's "sharp, intuitive wit" before hinting at recent tensions between the two of them. "God knows how much we argued," he said. "Right up to the end we found conflict with each other, which now means nothing. It just means nothing." He urged mourners at St Mary's Church in Thame, Oxfordshire: "If there's conflict in your lives - get rid of it." He said Robin, 62, who died from kidney failure last month after fighting cancer and pneumonia, had finally been reunited with his twin. Barry recalled the decade of separation endured by Robin since Maurice died in 2003. "When you're twins, you're twins for life," he said. "You go through every emotion. "And they're finally together. I think the greatest pain for Robin in the past 10 years was losing his twin brother, and I think it did all kinds of things to him." Hundreds of mourners wept as Robin's ornate white coffin entered the church to the sound of the Bee Gees' hit How Deep Is Your Love. Barry and the vicar leading the service, the Reverend Alan Garratt, walked up the aisle ahead of it as a round of spontaneous applause broke out from well-wishers outside the church. Close relatives, including Robin's widow, Dwina, and his mother followed behind. One woman was so overcome with grief she had to be physically supported as she walked to her seat. 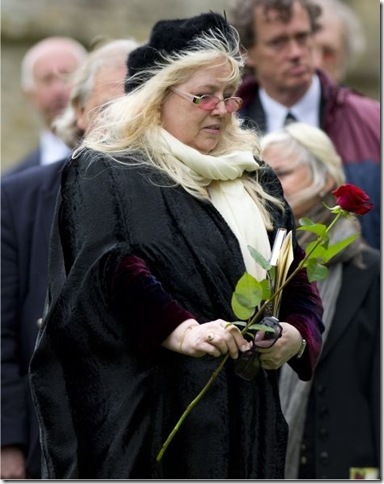 Robin's young daughter Snow, whose mother is a former housekeeper of his, did not attend the service - but was mentioned by Barry at the end of his eulogy as "little Snow" in a list of close family members. Barry paid tribute to his brother's "magnificent mind and his beautiful heart". 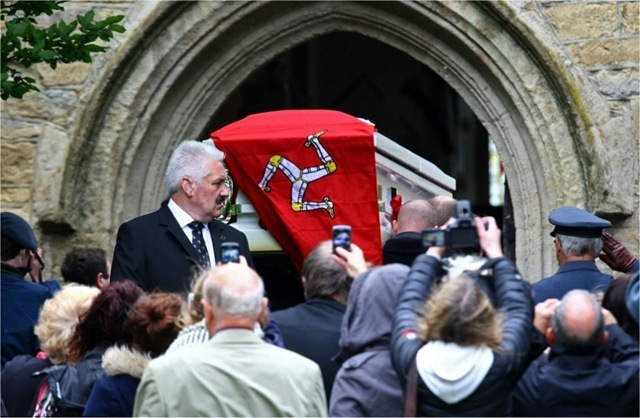 Minutes after the funeral cortege had picked its way through the streets of his brother's adoptive town, he told mourners: "Life is too short; in Robin's case, absolutely too short. "We should have had 20 years, 30 years of his magnificent mind and his beautiful heart." Referring to Maurice, he added: "They were both beautiful. And now they're together. They're actually together." The Gibbs' elderly mother, Barbara, was too distraught to remain in the church as Barry delivered his eulogy. Her surviving son said: "This is a very strange experience, having already lost two brothers and now Rob. "I think there are an awful lot of things happening right now that maybe you won't be aware of. And one is how many people came on such a terrible day. It is staggering. "So many people loved this boy, so many illustrious people are here that loved him. And that is such a pleasure to witness. "The three of us have seen a lot of crowds but I've never seen so much love in one crowd as I'm looking at today - for Rob, you know, for the music. And it's an intense experience for me. "I think it's an experience none of us will forget. We will keep him in our hearts and minds forever." 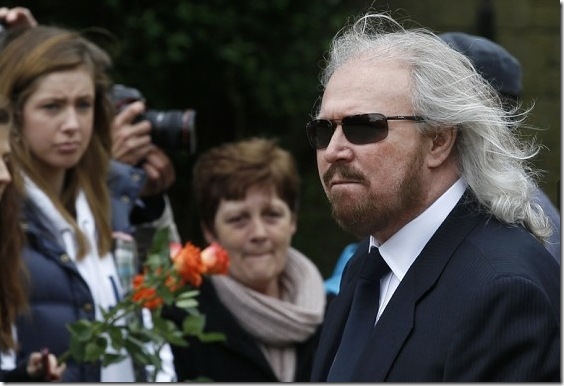 Hundreds of Bee Gees fans lined the streets to bid the singer a final, tearful farewell. The white, glass-sided carriage bearing his coffin was pulled through the throng by four plumed, black Friesian horses. Each wore a decorative black cloth emblazoned with a gold treble clef in honour of a career steeped in musical folklore. Ahead of the horses was a lone piper, behind them relatives and friends, and finally, Gibb's beloved Irish Wolfhounds, Ollie and Missy. 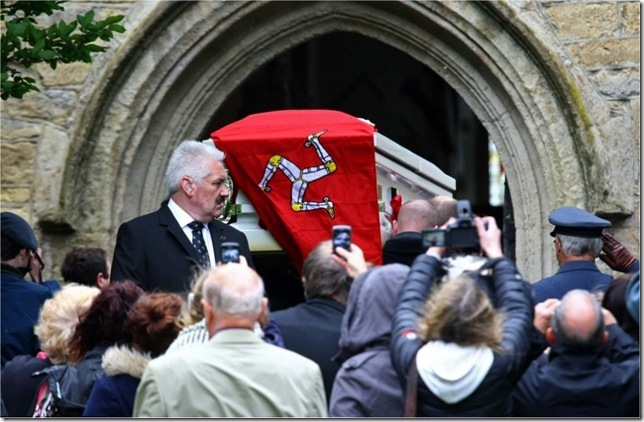 It had been the singer's final wish to "say a final goodbye to fans and his home town of Thame", and he did so in typically flamboyant style. The cortege emerged from the gatehouse of Robin's estate and then moved slowly up the town's High Street. It was welcomed to the church by the strains of the Bee Gees hit How Deep Is Your Love? Gibb's widow, Dwina, was at the head of the cortege, together with his mother. The singer's sons, RJ and Spencer, were joined as pallbearers by Barry's son, Stevie, and Dwina's son, Steven Murphy. 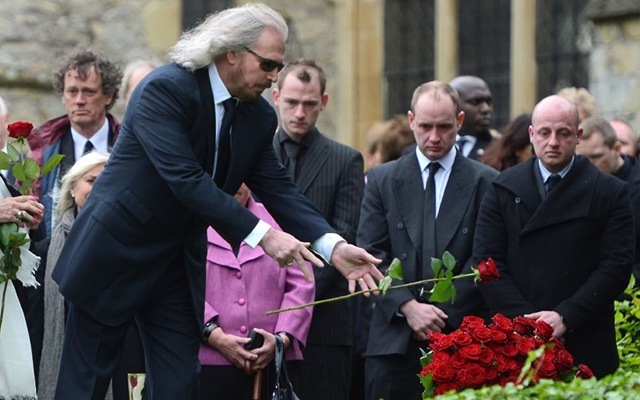 Mourners included Sir Tim Rice, Uri Geller, Peter Andre and the DJ Mike Read. During the service Dwina read a poem called My Songbird Has Flown. It included the words: "My songbird has flown and my soul sighs - but he will never go away." She was embraced by Barry as she returned to her seat. The poem was followed by a recording of Don't Cry Alone - one of Robin's last compositions, from his Titanic Requiem, which premiered just weeks before his death. Guests left the church to the sound of the Bee Gees' song I Started A Joke, which includes the line "I finally died, which started the whole world living". Brian Wilson (Beach Boys): Robin was 'part of the family'. I love the Bee Gees voices, they're some of my favorite singers. I am so sad. 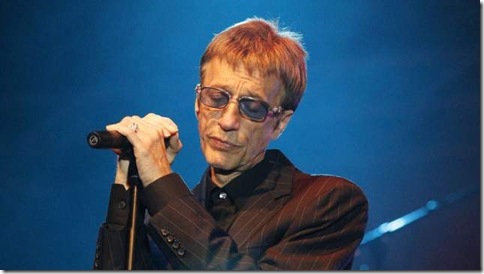 Bryan Adams: Robin Gibb RIP. Very sad to hear about yet another great singer dying too young. Justin Timberlake: We have lost a truly brilliant musician today. One of my idols. My heart goes out to the Gibb family in this time of sorrow...RIP Robin. 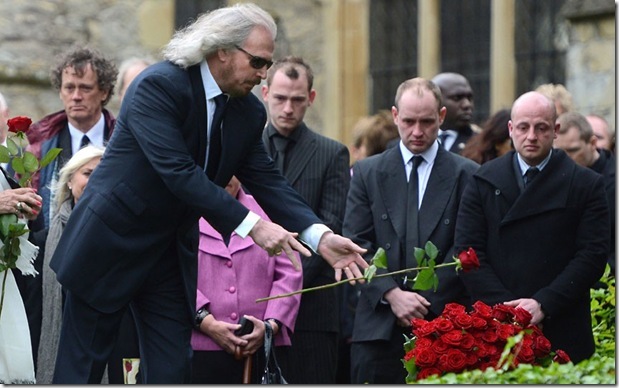 Mick Hucknall (Simply Red): RIP Robin Gibb. A musical giant. Gary Barlow (Take that): I'm so sad to hear Robin Gibb has passed away.Such a great loss.His music will out live us all. Richard Marx: Robin Gibb RIP. The Bee Gees were so important to pop music. Huge loss. Skin (skunk anansie): R.I.P. Robin Gibb, I LOVE the BeeGees music, amazing songwriters, great voices, beautiful stories. 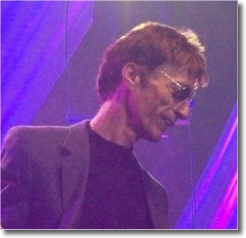 The Doors: We send our condolences to the family and fans of Robin Gibb of the Bee Gees, who passed away today. Kim Wilde: I toured with Robin Gibb in Germany.Always a true gentleman.He has left us an amazing legacy. Jermaine Dupri: BEE GEES ~ LOVE YOU INSIDE OUT ~: RIP ROBIN GIBB,MY FAVORITE BEE GEES RECORD BY FAR, "LOVE YOU INSIDE OUT"
Boy George: So sad to hear about the loss of Robin Gibb, my prayers to his loved ones! R.I.P. Robin Gibb, componente dei leggendari Bee Gees, è morto a Londra all'età di 62 anni. ANSA.IT: "Addio a Robin Gibb, mito dei Bee Gees"
TGCOM24: "E' morto Robin Gibb dei Bee Gees"
SKY.IT: "Addio a Robin Gibb, la leggendaria voce dei Bee Gees"
BBC.CO.UK: "Bee Gees singer Robin Gibb dies after cancer battle"
REUTERS.COM: "Singer Robin Gibb, Bee Gees co-founder, dies at 62"
Sul sito ufficiale di Robin Gibb sono disponibili tante notizie ed anteprime sul “Titanic Requiem”, il lavoro al quale Robin e suo figlio Robin John hanno lavorato in questi mesi. Seguirà breve un comunicato stampa.